Jacket & Gillet - Pre Loved Kilo Sale. If you love vintage clothing and you love a bargain that there is no better event to attend than the Pre Loved Kilo Sale. Advertised as 6 tonnes of preloved, vintage and retro clothing by weight. Only £15 per kilo. two cities every weekend! These can be found on their Facebook page. Every time the Pre Loved Kilo Sale comes to the Hackney Round Chapel, I make the effort to go - and it always pays off. Yesterday I popped into the sale knowing that I didn't really need anything. 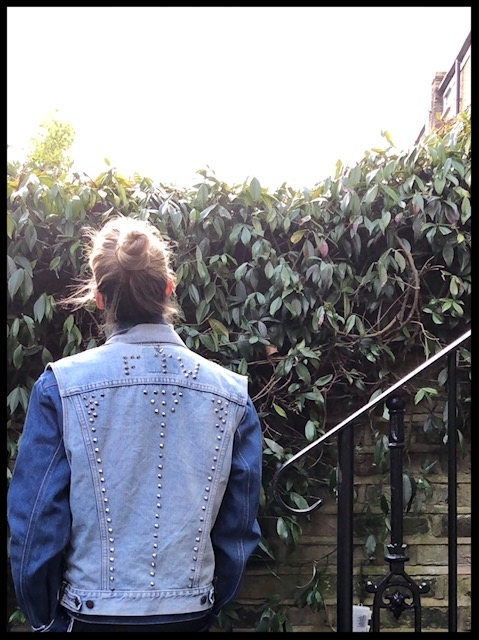 I've been mulling over a project reusing denim jackets... There were rails of dresses, blouses, jackets, you name it, but knowing I have enough clothes I stayed clear and just hit the denim jackets rails - I thought I might as well see if there's anything I could reuse. On entry you pay £1.50 and your given a large, clear plastic bag - simply select what you want to buy, pop it (minus the hanger) into your bag and when you've finished - go to the weigh and pay area - and pay. 5 Denim jackets weighed in at 3 Kilos = £45 = £9 A jacket - not bad!